As mentioned, the main attraction of the dinner party was a lovely planked salmon dish...this is such a nice thing to have in the summer and it just so happened that I had picked up a number of cedar planks the last time I visited costco (they are expressly marketed for the purpose - I'm sure I paid a premium, but at least I can be reassured that they are not coated in all sorts of ucky chemicals....or I can tell myself that, anyway). I was peeved with my salmon though (also from Costco). I'd been doing some reading about farmed salmon, so I've also been avoiding that lately in favour of the wild stuff (which is, of course, infinitely more expensive). I picked up some nice fillets of wild salmon, and when I got them home, I turned them over and found out THEY STILL HAD SKIN ON THEM. YUCK. I don't know anyone who eats salmon skin, so I really don't know why they bother leaving it on. How can you have a nice dinner plate, only to end up with wrinkly, rejected, nasty scaly skin left on it. So I had to skin the salmon (really NOT my favourite thing to do), and it looked more than a little butchered afterward. Gross. The final result was delicious though! Highly recommend for seafood lovers! 1. Combine all paste ingredients in the food processor. Process until well blended. Taste the mixture - perhaps you like it a bit more acidic, or a bit sweeter, saltier or whatever. Season to your liking. I like mine on the sweet side, particularly because I was pairing it with two side dishes that were not sweetened. 2. Soak your cedar planks for 4-6 hours beforehand (the longer you soak, the longer they resist burning). 3. 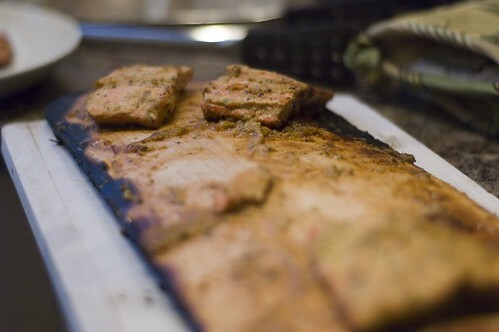 Arrange salmon on planks and douse with paste mixture. Cook over medium heat for about 15 minutes, keeping a spray bottle handy to extinguish flames. Alternatively, you can cook over indirect heat, but you won't have as much cedary steam going up through your salmon. It's safer, but not as flavourful. Yum. 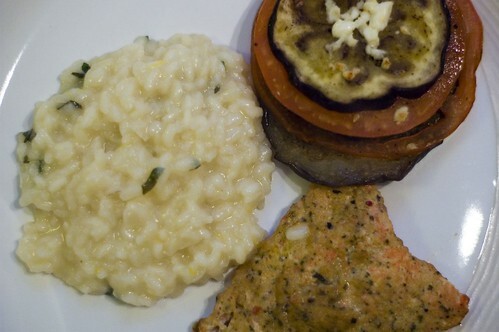 I paired the salmon with a nice lemon risotto. I used the 'make-ahead' method for the risotto, as I wasn't terribly keen on stirring for forty minutes while I had guests entertaining themselves (and hubs bbq'ing). Basically, it's the same process, except when you've added 3 1/4 c. of the broth, you stop. 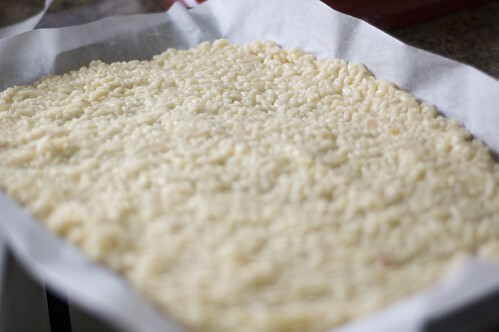 You spread the semi-cooked risotto out on a baking sheet (use some parchment paper to save washing!) and cover and cool it. You can resume as normal when you want to eat, adding the rest of the broth and the add-ins. This method can be used with any risotto. I stole this recipe from epicurious as well. 1. Bring broth to simmer in large saucepan over medium heat. Reduce heat to low; cover to keep warm. 2. Melt 1 1/2 tablespoons butter with oil in heavy large saucepan over medium heat. Add shallots and sauté until tender, about 6 minutes. 3. Add rice; stir 1 minute. Add wine and stir until evaporated, about 30 seconds. Add 1 1/2 cups hot broth; simmer until absorbed, stirring frequently. Add remaining broth 1/2 cup at a time, allowing broth to be absorbed before adding more and stirring frequently until rice is creamy and tender, about 35 minutes. (As mentioned above, if you want to make in advance, only add 3 1/4 c. of broth and then stop the process). 4. Stir in cheese and remaining 2 tablespoons butter. Stir in parsley, lemon juice, and lemon peel. Season risotto with salt and pepper. Transfer to bowl and serve. Makes 6 first-course or 4 main-course servings. This is a lovely side dish with fish. The last thing I had on the plate were these beautiful little stacks of eggplant and tomato. I saw the initial picture and was totally sold. The bonus is that these used the same type of basil oil as I needed for the canteloupe salad, so I only had to make it once. Of course, my tomatoes ended up being too big but whatever. It still looked pretty. Woot woot for that. 1. Blend basil with oil and 1/2 teaspoon salt in blender until finely chopped. Pour into a paper-towel- or coffee-filter-lined sieve set over a bowl and let drain 20 minutes. 2. Gather together sides of towel or filter and press gently on it to extract more oil. (You will have a generous 1/3 cup oil.) Scrape basil solids into a small bowl and reserve. 3. Preheat BBQ to medium heat. While grill heats, cut off bottoms of eggplants, then cut 6 (1/2-inch-thick) crosswise rounds from each, starting from cut end. Reserve remaining eggplant for another use. Cut 4 (1/3-inch-thick) rounds from large tomato and 2 center slices (1/3 inch thick) from each medium tomato, reserving remaining tomato for another use. 4. 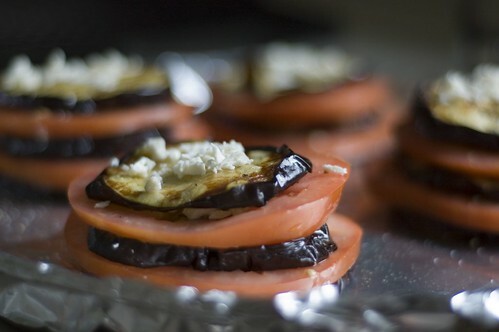 Lightly brush eggplant rounds on both sides with basil oil and sprinkle with 1/2 teaspoon salt and 1/4 teaspoon pepper. 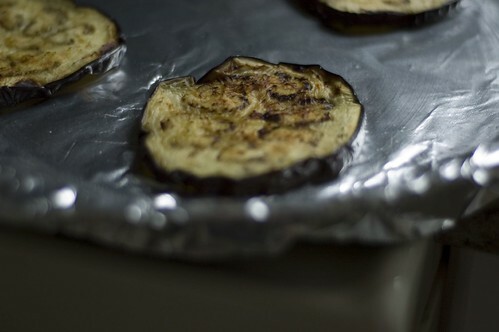 Grill on a lightly oiled grill rack, covered only if using a gas grill, turning over occasionally, lightly brushing eggplant with more basil oil occasionally if it looks dry, until eggplant is very tender, 6 to 10 minutes. 1. On baking pan, arrange 4 largest eggplant rounds side by side and spread each with a generous 1/2 teaspoon of reserved basil solids, then top each with 1 of 4 largest tomato rounds. 2. Season tomatoes with salt and pepper and top each with about 1 tablespoon feta. 3. Make another layer with medium-size eggplant rounds, basil solids, medium tomato rounds, salt, pepper, and feta, then top with remaining eggplant and feta. You can make the stacks up in advance and just heat them in the oven (about 350F) for 10 minutes or so. YUM. I don't even bother removing the skin from salmon anymore. Especially if you're cooking wild salmon, the skin adds lots of flavor and is simple to remove after cooking - just slide your spatula between the flesh and skin and it comes right off. Absolutely adore those little stacks! If you plank with the skin on, it sticks to the board so it's easy just to pull off the flesh. oooh and - the salmon at my costco never has the skin on it! How weird! You gotta love your salmon post! It's always wonderful to see how many different ways people prepare salmon. Some love skin on or skin off.